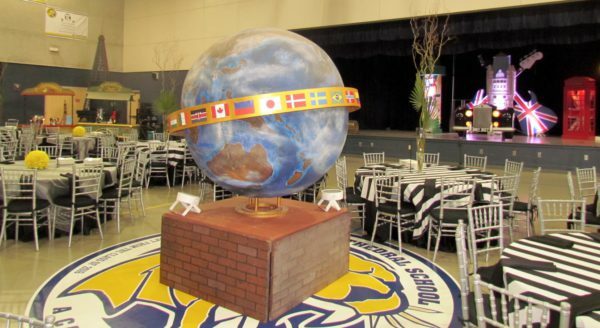 Max King Events had the opportunity to travel “Around the World” with St. James Cathedral School for their international themed event. 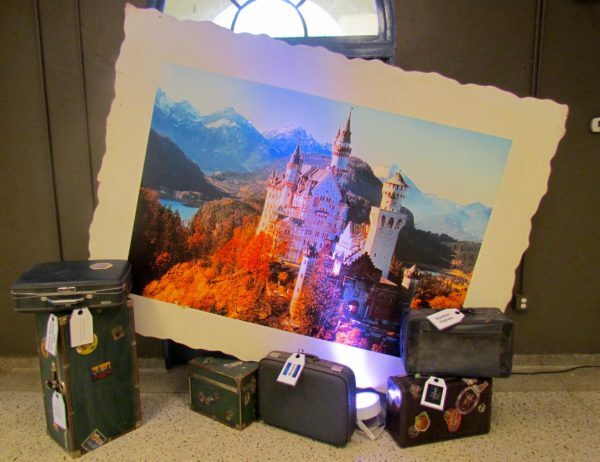 Iconic attractions from across the world made an appearance to create another unforgettable event. 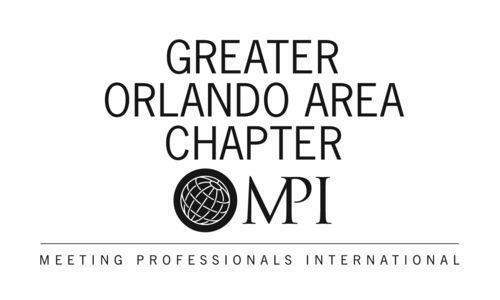 The event kicked off with the attendees first going into the school cafeteria, which had been transformed into a cocktail reception where they could bid on the various auction items. 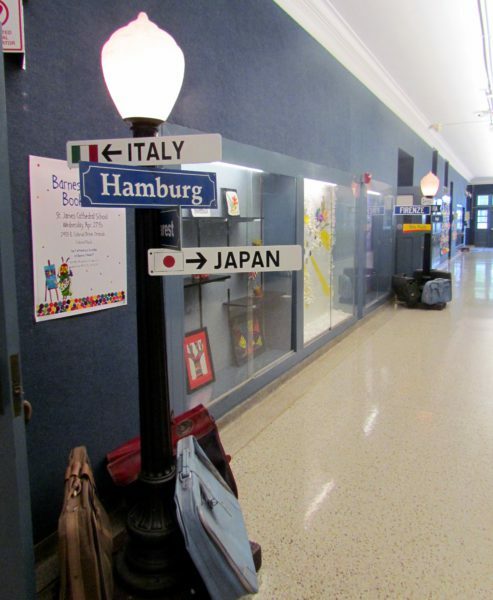 We created an entryway using our Single Globe Street Lamps that had an array of international street signs and directionals. 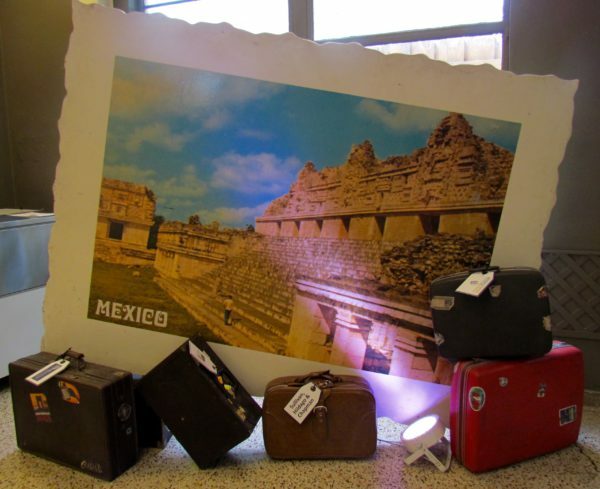 A variety of Oversized 4’x6’ International Postcards were exhibited throughout the auction room as perimeter décor pieces. 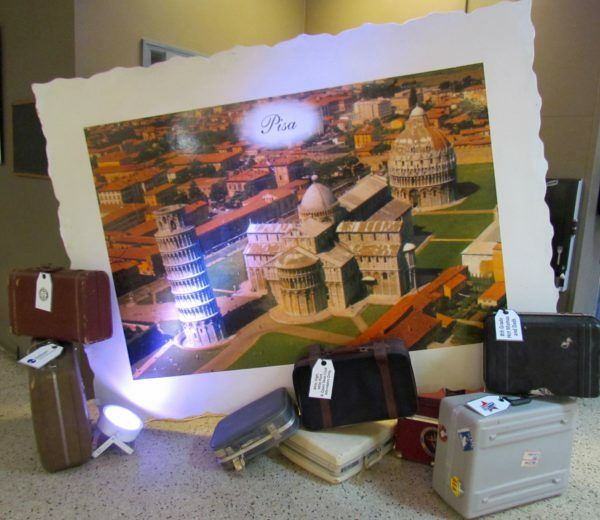 Each oversized postcard had a grouping of vintage luggage pieces that featured custom luggage tags, which provided the perfect opportunity to recognize the events sponsors. 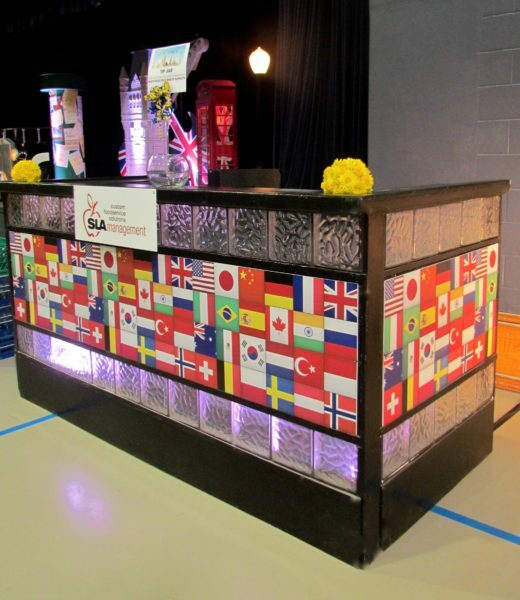 To go along with the international theme, we created a custom fascia for our Glass Block Bars. 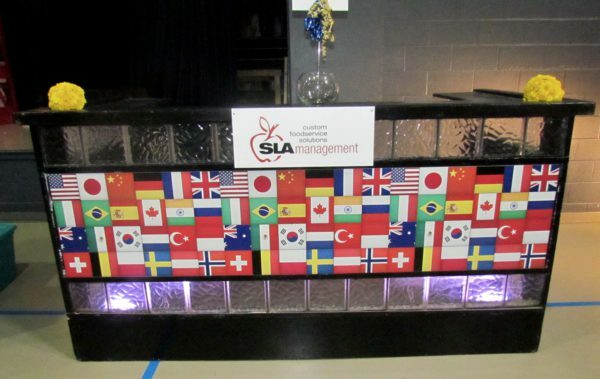 The new fascia featured an array of international flags. We placed these bars side-by-side to create a double bar. The main event took place in the school’s gym. We used another set of Street Lamps to flank the doorways. This created a simple entryway that offered some atmospheric lighting as well. Our Rotating Globe was used as the center room focal point, surrounded by tables. The fully colored globe sported a gold orbital ring that displayed an assortment of flags from international countries. The stage was used to represent the city of London, England. 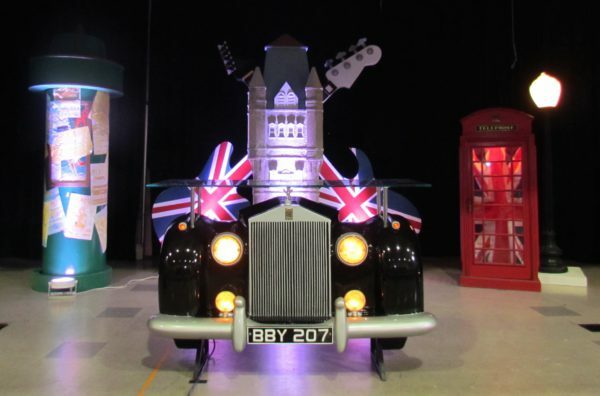 Our black and white Rolls Royce Car Front was utilized as a DJ table at the front of the stage. Behind it, we created a London vignette by mixing various British décor. 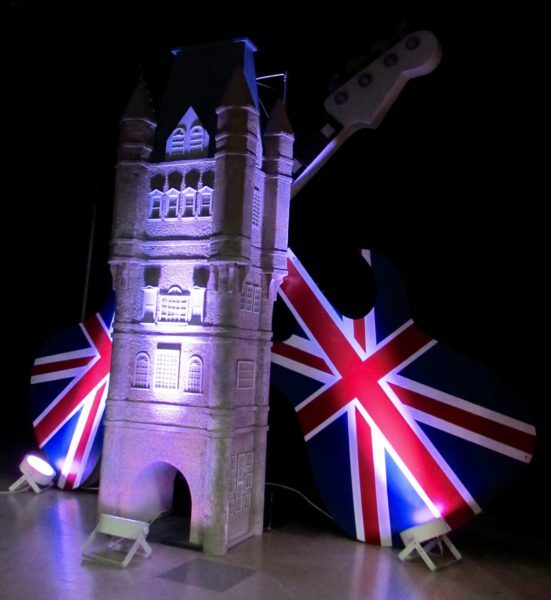 To do this, we used a piece from the iconic Tower Bridge of London and placed it in front of two 12ft high guitars with British Flag fascia set in a crisscross formation. On one side of the stage we placed our London Kiosk that sported an array of Beatles posters, and on the other, we used the ever-recognizable London Phone-booth. The United States was represented in one of the four corners on the room. 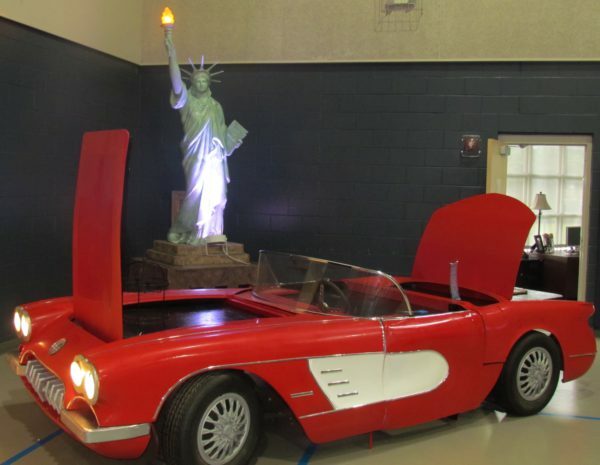 Our 11ft tall Statue of Liberty formed the ideal background, while our red 1958 American Corvette Convertible created buffet and food service space where classic American dishes were served. 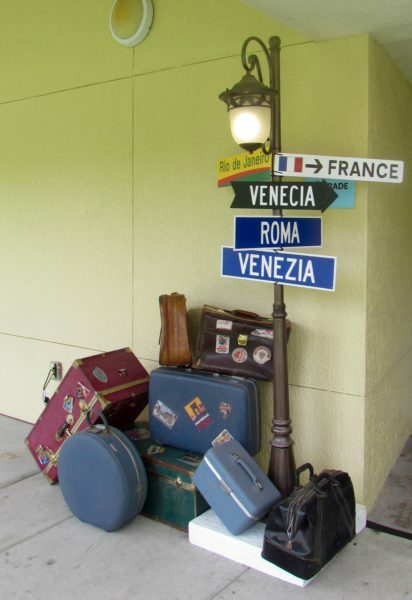 Next stop, Italy! 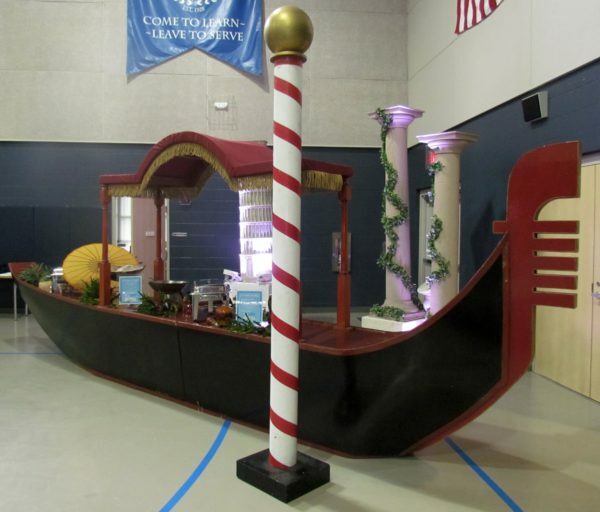 Our 18’ long Gondola Buffet was replicated as one of Italy’s famed water taxis. Finished in black with a burgundy trim, the canopy structure offered unique double sided buffet space. 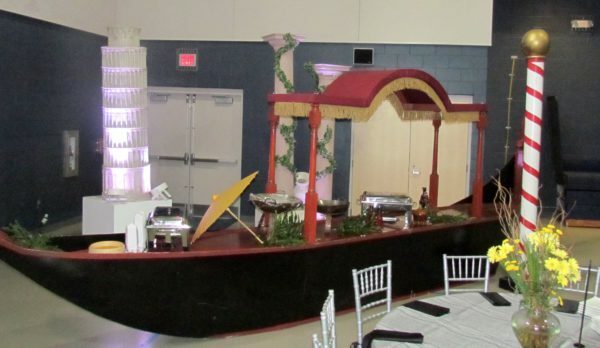 Behind this piece was our replica of the famous Leaning Tower of Pisa that was paired perfectly with 10’ and 12’ Tuscan Columns wrapped in grapevine. Grape filled urns sat elegantly at the base alongside amber up lighting. Asia and the Far East were represented with our 10’ Grand Tori Gate walkthrough. 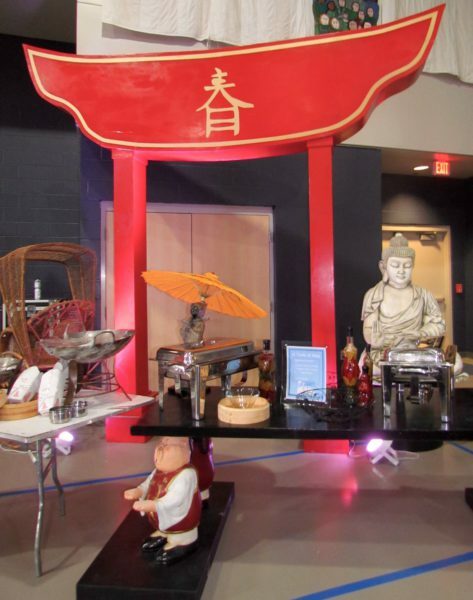 In front of this piece was our Whimsical Chinamen Action Station, used to create another buffet area. 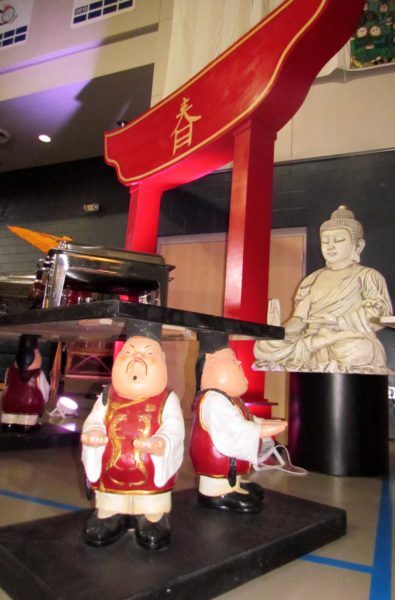 An Ivory Buddha Statue along with a Rickshaw helped set the East Asian ambiance. The attendees said, “Bonjour” to France with our 14’ replica of the Eiffel Tower, completed with brilliant up lighting and lush ferns. 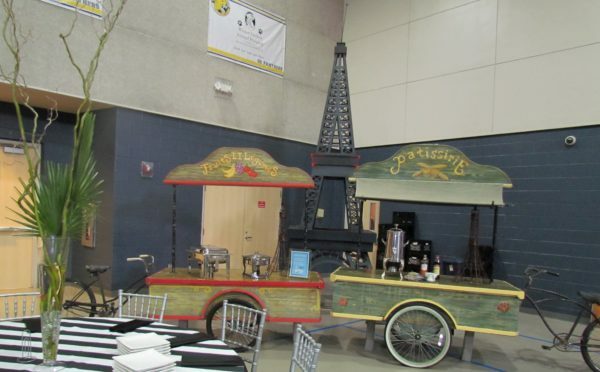 Our Parisian street-style Vendor Tri-Bike Buffets set the mood to serve traditional French hors d’oeuvres. Another set of Glass Block Bars were placed in the gymnasium. These bar surrounds were designed with a custom international flag fascia and trimmed with inner-lit glass to create unique beverage stations. 8 feet of Mirrored Dessert Walls designed the perfect spot for guests to enjoy an assortment of sweets from around the world. 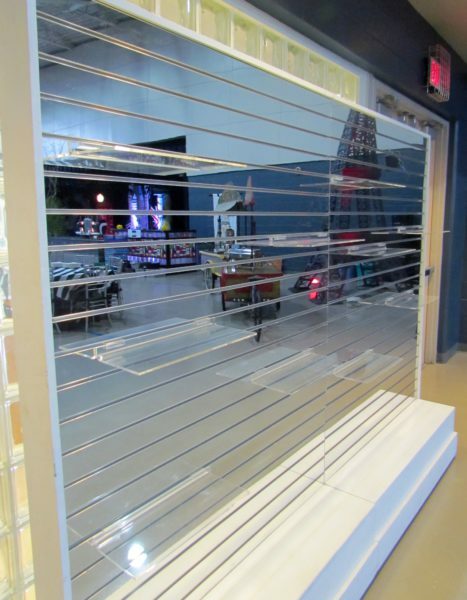 Clear acrylic shelves created seamless spaces for the desserts to be displayed. Our MKE team enjoyed the journey with St. James that led to creating this unique event. 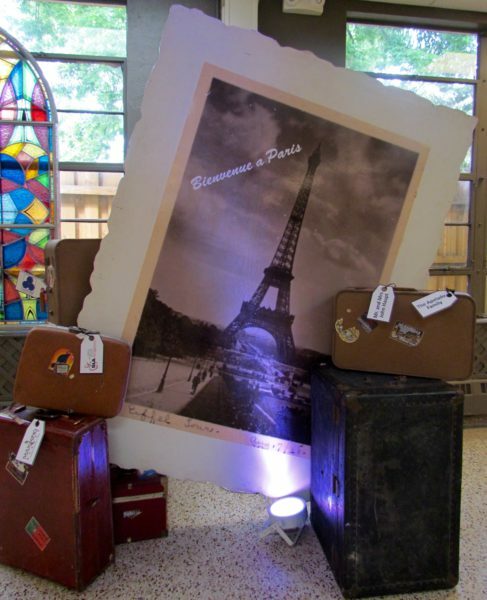 We were able to incorporate a multitude of different décor pieces in order to make each international area come to life!